Ok, so this is a new project I'm doing, inspiRED by One Sheepish Girl. Today was our Bible study at Barlow, the day IMPACT gets together. We went over Phillipians chapter 3 :) And talked about other books in the Bible. Julia (The leader, the one who puts together everything. I love her!) challenged all of us to read our Bibles EVERY day! I want to take up that challenge. She also challenged us to pray more! Like if you pray only 10 minutes a day, pray for 20 or 30 a minutes a day. I'm going to try to do this, because you know, being a sophomore in high school, taking honors classes takes up a bit of time. 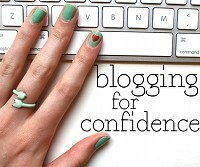 This is where the 'Blogging For Confidence' comes in... I felt very awkward taking pictures while she was speaking... but it's not like I made a big deal about it, I just snapped a few pictures while she was speaking. It was kinda awkward... but I'm so glad I did it!! So glad I did this!! :) Visit our facebook page: IMPACT on facebook. Thanks April! Yeah she should! Every little thing counts. We had this last year too on Tuesdays after school, but now we do it in the hall ways during school since we don't have time after school. :) It's very fun and I feel closer to God. I feel we are speaking out by doing this.